Successful students approach their studies with the right behaviours, skills and attitudes. They’re no different cognitively, but they work more effectively, they’re determined and organised, they give more discretionary effort, and they get top results. Success at A level is a result of character, not intelligence. This book shares the secrets of coaching your students to grow their mind-sets and get the best grades. Suitable for teachers, tutors, heads of sixth form or anyone else who wants to help A-level students achieve their potential. 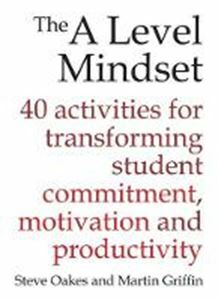 It offers forty easy-to-use activities that will supercharge your learner’s ambition, persistence and determination. It could be your key to transforming student outcomes.